Earn $19.48 in Rewards credit (1948 points) What's This? Norco Bicycles’ 2018 Search XR-S Frameset features a lightweight Search Reynolds 725 Chromoly steel frame and Search SL High-Modulus Carbon fork with tire clearance up to 700 x 45c. Multiple subtle mounting points for racks, bottle cages, lights, and other accessories. In removing the seat-stay bridge for increased vertical compliance, Norco created a custom plastic bridge, the SASSY, for easy fender mounting. The Das Boot seat clamp cover protects against water and mud infiltration. Search Reynolds 725 Chromoly frame. Search SL High-Modulus Carbon fork. Front & rear 12mm thru axles. Tire clearance: 27.5” x 2.1” / 700c x 28c-45c tires (up to 42c w/ full fenders). Subtle rack & fender mounting points. Das Boot seat clamp cover. SASSY custom plastic bridge fender mount. Easily handles up to 20kg (44lbs) load. Nicely finished frameset with thoughtful details. Building up now. 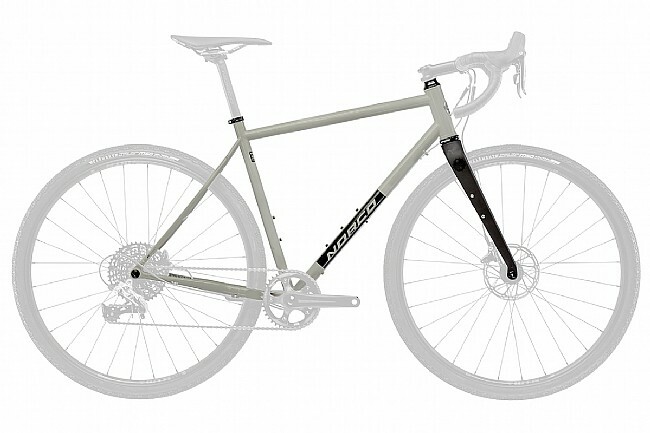 I'm in the process of building a bike based off this frameset so no ride report yet. However, it's gone together smoothly. One minor hiccup was the top cup of the headset was missing. My local Norco dealer sorted it out very quickly though. This is my second Norco and the customer service from them has been spot on!